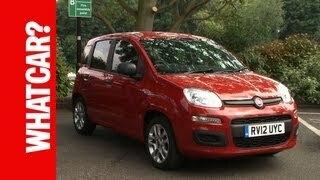 At the upcoming Frankfurt Auto Show, Fiat will present the all-new evolution of a successful city car, the 2012 Fiat Panda. The Panda is all this and something more: a brand rich in strong rational and emotional value, which has won over more than 6.5 million drivers by supplying simple but smart solutions for the real necessities of everyday mobility. Everything is a whole lot easier on board the Panda. It is easier to move, park, have the right amount of space and modulate it to your liking, feel at ease and relate with others. Important solutions that are expressed in a philosophy of life. Fiat presents the new Panda at the Frankfurt International Motor Show. It is a consistent evolution of a successful city car that in its 31-year history has always been a synonym of functional design, manoeuvrability, space, reliability and comfort. The Panda is all this and something more: a brand rich in strong rational and emotional value, which has won over more than 6.5 million drivers by supplying simple but smart solutions for the real necessities of everyday mobility. Everything is a whole lot easier on board the Panda. It is easier to move, park, have the right amount of space and modulate it to your liking, feel at ease and relate with others. Important solutions that are expressed in a philosophy of life. What's more, before being a car the Panda is an idea that has generated another way of experiencing a car in total freedom. That's because today as always, whoever chooses a Panda is free from the conventional mould, fashions and classifications. In a sense, you could say that it is an unconventional car, which from its very first generation was able to astonish with simple yet not obvious solutions. Indeed, it is precisely its vocation of structural and constructive simplicity that now allows it to further evolve without ever losing its true nature of revolutionary car. Suffice it to say that it was the first car of its segment to bear the prestigious title of "Car of the Year 2004". It was the first compact (less than 4 metres in length) to feature a diesel engine (1986) and it was the first to offer both four-wheel drive (1983) and a range of eco-friendly engines designed to limit fuel consumption (the Panda Elettra was introduced in 1990, one of the first electric cars). It was the first 4x4 city car to reach Everest's high-tech base camp at an altitude of 5,200 metres (2004). With the third generation, the Panda has reached full maturity, making a further qualitative leap in terms of comfort, technology and safety equipment, and making its appearance with a new, modern and harmonious look. But without giving up that "roguish" and ready-for-anything soul that has always distinguished it. Starting from the concept that every one of us has different requirements, the new Panda makes maximum use of the interior space, minimising the obstructions. Although continuing to be a very compact car, the Panda has grown just a few centimetres to ensure the attainment of the highest standards of safety and improve the generous level of passenger room and capacity of the boot still further. With a length of 365 centimetres, a width of 164 and a height of 155, the new Panda can comfortably accommodate up to five people and is equipped with one of the roomiest luggage compartments in its segment. In addition, modularity is enhanced thanks to the numerous storage compartments and the different front and rear seat configurations. Besides, every one of us has our own lifestyle, a personal relationship with our own objects, our own way of distributing them in space. And of finding them. So in this sense the new model is a place to fill in an entirely personal way, but at the same time it is a place that you are glad to share with others. Once again, Fiat is raising the bar to prove that it is leading the evolution of the super-compact segment, where a large part of history carries its name: from the first 600 to the 500, from the 126 to the first Panda, from the Cinquecento to the Seicento, from the second generation Panda (2003) to the new 500 launched in 2007. 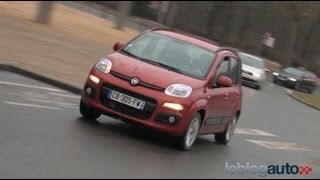 There has always been a Fiat city car near the people, and now it is the Panda's turn once again. Its production will begin in the last quarter of 2011. The new Panda has been created drawing inspiration from the most up-to-date trends. It proposes an elegant restyling of the exteriors with smooth and rounded lines on a volume of regular form and of great spatial efficiency. Its front has a strong personality, where the slightly convex bonnet joins with the elegant horizontal grille and the new front headlamps with a rounded shape, underlined by a separate supplementary element with Daytime Running Lights function. The side view has also been updated, where several distinctive features of the second-generation Fiat Panda have been reinterpreted starting with the third window, now with softened angles in harmony with the softer shape of the exteriors, which creates the effect of an uninterrupted glazed surface up to the vertical rear light clusters. Smooth and rounded shapes also distinguish the bumper strips on the bumpers and side panels that not only pay tribute to the first generation Fiat Panda, but also accentuate the "all-terrain" look of the model also accompanied by the marked wheel arches. Finally, as on the current model, the lower section of the tailgate protrudes with respect to the rear window. Combined with the side line, this gives a distinct impression of a roof panel resting on the bodywork. The interiors consistently continue the stylistic choices of the exteriors and provide a spacious, functional and comfortable passenger compartment, which can bear comparison with that of higher category cars. What's more, flexibility has always been one of the strong points of the Panda model, as proven by the rear seat, which can be split and sliding, and the front passenger seat backrest, which can be folded to form a table. This equipment, exclusive for the category, combined with the cargo box option for the boot, offers a nearly flat loading area so full use can be made of the entire length of the interior. The new dashboard was designed as a practical multifunctional shell, inside of which a large storage "pocket" was made, just like the first version of the model. The shell is wrapped up in a colourful frame, without interruptions, which serves as a single perimeter to the steering wheel, radio and main controls, and that houses the vents and passenger airbag. Also in this case there is a return to the first generation Panda, where the elements were tightened to the fabric "pouch", which constituted the main part of the dashboard. In short, it is a car destined to continuously surprise us owing to its ability to transform itself according to the situation and adapt to the needs of whoever uses it, driver or passenger as the case may be. What's more, offering original style, advanced technology accessible to everyone, and smart solutions that simplify and improve life on board is in Fiat's DNA. A project that from the very beginning had a single goal: to improve - in the "evolutionary" sense - a successful model and prove that Fiat is the undisputed leader of the city-car class. 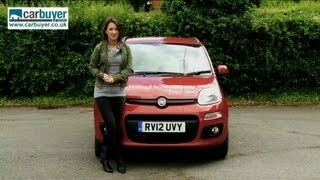 For this reason Fiat set its sights on top quality through the entire product development process and its engineering. To welcome the new Panda, a new production line in the "Giambattista Vico" plant in Pomigliano D'Arco (Naples) was built. It is an advanced industrial showcase that fully applies World Class Manufacturing principles and methods. This is a series of processes implemented in Fiat Group plants and those of its suppliers that are aimed at reducing inefficiencies and at achieving "zero accidents, zero faults, zero stock, zero break-downs" goals. The operational innovations introduced in the various departments ensure modularity and flexibility that, when combined with the improved ergonomics and assembly operation sequence, have the purpose of optimising construction quality and the model's reliability. In detail, the Sheet metalwork department contains a production backbone with automatic and flexible lines created for the direct supply of the sub-groups ("zero forklifts" logistics), the Open Gate for forming the body, made up of 14 robots that simultaneously execute 84 welding points and automatic plating ("hanging line"), that is application of the mobile parts (doors, tailgate and bonnet) to the bodies by using 603 state-of-the-art robots. The innovations continue at Assembly, where we find the "trim line" with variable height skillet, the "flex decking" for automatic vehicle body fitting and the revolving hooks in various stations of the production backbone. Finally, in the metrology room a series of gauges and measuring machines check that the parts comply with the design by measuring, for the body for example, about 2000 points for the existing pieces and up to 3000 points for the pressed pieces. Then with the "Meisterbock" and Installability Master equipment it is possible simulate the assembly of all the body and bodywork elements by perfectly analysing all the coupling zones. In addition to its quality of construction, the new Panda is also distinctive in the care devoted to selecting materials, the matching and choice of colours, and the interior trims. The result is a quality passenger compartment where everything seen and touched is always pleasant to the eye and touch. Offered with five doors only and with roominess worthy of a higher segment, the new Panda proves that it is a real super-compact. Its smaller exterior dimensions in relation to its interior volume are an invaluable feature for a car principally intended to be used in urban areas. But the new Panda is able to do more. In fact it has all the properties of dynamism and comfort that allow it to easily tackle longer and tougher extra urban routes: driving ease, functional and ergonomic layout of controls and furnishings, a large number of storage compartments, and use of seats with "thin" backrests that improve accessibility and comfort for the rear passengers. Finally, the position of the gear lever in the centre of the dashboard, the raised seat base and the large windows guarantee driver and passengers excellent visibility and mastery of the road. The diving dynamics are supported by a tried and tested suspension configuration: MacPherson independent wheel up front and interconnected wheels (semi-independent) with a torsion beam in the rear. 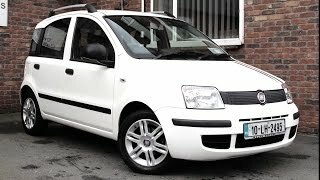 Functional and reliable, the Fiat Panda is a car rich in substance that boasts cutting-edge engines in terms of both performance and fuel consumption and emissions. Standing out in the range are the brand new two-cylinder engines: the 85 HP 0.9 TwinAir Turbo, named "International Engine of the Year 2011", and the 65 HP 0.9 Aspirated TwinAir, both equipped with the Start&Stop system as standard, which temporarily cuts out the engine and restarts it in order to reduce fuel consumption and CO2 emissions. The renewed 69 HP 1.2 Fire completes the range of petrol engines available at the launch. The engineering excellence of the new Panda continues with the 75 HP 1.3 Multijet II with Start&Stop supplied as standard. Belonging to the second generation of the MultiJet family, the engine is equipped with faster injectors capable of multiple injections in rapid sequence. Specifically, the system can now perform a main modulated injection of fuel in several distinct phases and anticipate the ones that follow. The servo valve with balanced plunger of the MultiJet II system enables it to manage up to 8 injections per cycle, offering greater speed, flexibility and precision in the various phases of operation. Then the bifuel 80 HP 0.9 TwinAir Turbo Natural Power (petrol/methane) and 69 HP 1.2 EasyPower (petrol/LPG) will follow. They are proof of the constant attention Fiat Automobiles focuses on environmental issues through research and development of easily accessible solutions. In perfect harmony with the "eco-friendly" spirit, the new Panda also offers the Gear Shift Indicator (GSI), a genuine "co-pilot" that discreetly prompts drivers to change gear, leading to more efficient use of the engine and to reduce fuel consumption. At its launch, the new model will be available with front-wheel drive - and later the Panda 4x4 will make its debut - and will offer a range made up of: 4 engines, 3 trim levels, 10 body colours, 4 interiors, 2 hub caps and 2 14" and 15" alloy wheels for a total of over 600 combinations. To ensure the safety of the driver and passengers, the new model has 4 airbags (front and window), ABS complete with BAS (Brake Assist System), front seat belts with pretensioners and load limiter, Isofix attachments for child seats, anti-whiplash front headrests, rear headrests and headlamps with Daytime Running Lights, all supplied as standard. In addition, the new model offers devices which are exclusive in its category: from the brand new "Blue&Me-TomTom LIVE" and the large transparent electric "Skydome" sun roof to the Hi-Fi system with CD/MP3 player and Dualdrive electric power steering with "City" function as standard. In particular, to drive in city traffic with total peace of mind the new Panda offers the "Blue&Me TomTom LIVE" device that combines the advantages of an infotainment system which is integrated and connected with those of a portable navigator, opening the doors to connectivity. "Blue&Me TomTom LIVE" will allow Panda customers to use mobile phones and media players in total safety without ever removing their hands from the steering wheel, and provides an absolutely unique and distinctive navigation experience, built into the dashboard and offering the most accurate traffic information updated in real time. The automatic Dualogic robotised transmission, in combination with the TwinAir engine, will become available after the launch. In addition, during the first year of sales, an innovative braking system will also become available which, at speeds below 30km/h, is able to detect obstacles at close range and stop automatically. These features make the new Panda a "big" car that, moreover, has a very high product value thanks to the combination of high contents and reduced running costs.